Signed for Aldershot Town from Hitchin Town for £10,000 in September 2001. 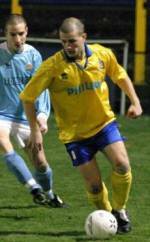 Adam scored 99 goals for Hitchin where he was also club captain. He had previously been with Stevenage Borough. Adam's strength is his uncanny ability to conjour up a goal out of nothing. Re-joined Hitchin in March 2003 and then moved onto Braintree Town in December 2003 before signing for the Saints in April 2004. Moved onto Thurrock in December 2004. Click here for "in conversation with Adam Parker"